Maximum likelihood estimates of the model parameters are computed by default. These are shown in the "Analysis of Maximum Likelihood Parameter Estimates" table in Output 43.10.1. Noninformative independent normal prior distributions with zero means and variances of were used in the initial analysis. These are shown in Output 43.10.2. Initial values for the Markov chain are listed in the "Initial Values and Seeds" table in Output 43.10.3. The random number seed is also listed so that you can reproduce the analysis. Since no seed was specified, the seed shown was derived from the time of day. 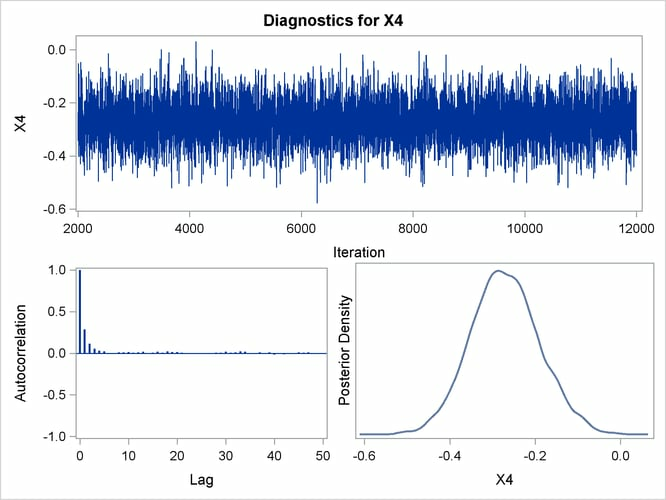 Summary statistics for the posterior sample are displayed in the "Fit Statistics," "Descriptive Statistics for the Posterior Sample," "Interval Statistics for the Posterior Sample," and "Posterior Correlation Matrix" tables in Output 43.10.4, Output 43.10.5, Output 43.10.6, and Output 43.10.7, respectively. 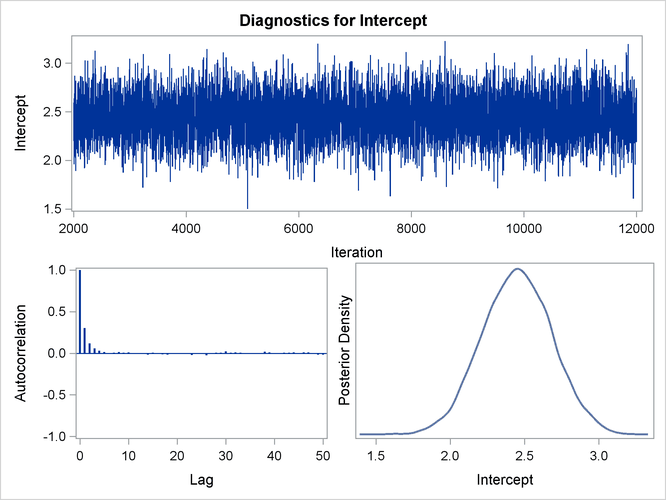 Since noninformative prior distributions for the regression coefficients were used, the mean and standard deviations of the posterior distributions for the model parameters are close to the maximum likelihood estimates and standard errors. Posterior sample autocorrelations for each model parameter are shown in Output 43.10.8. 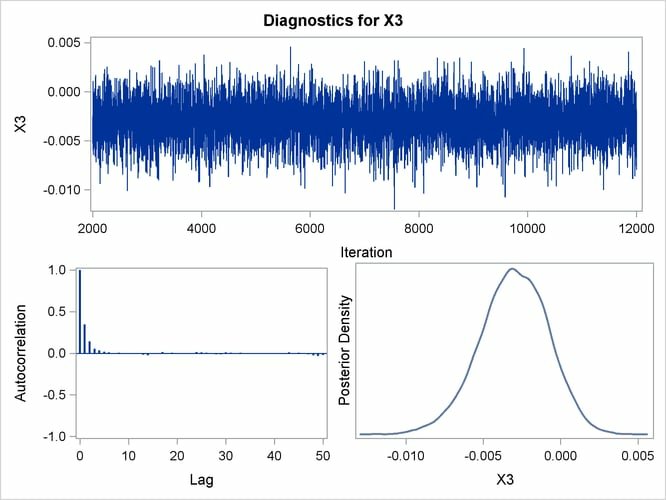 The autocorrelation after 10 lags is negligible for all parameters, indicating good mixing in the Markov chain. The p-values for the Geweke test statistics shown in Output 43.10.9 all indicate convergence of the MCMC. 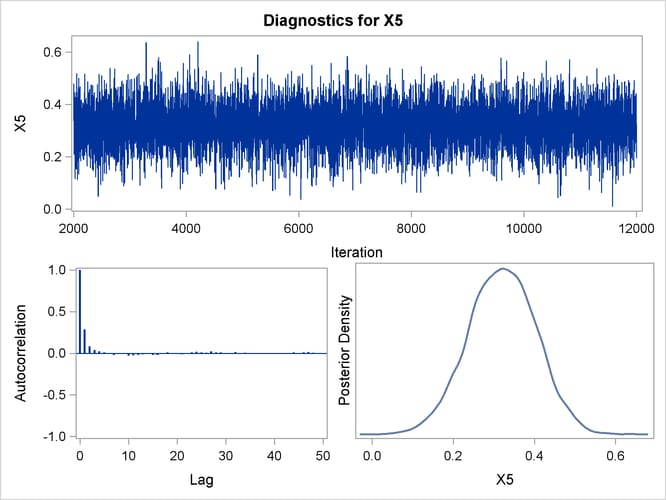 See the section Assessing Markov Chain Convergence in Chapter 7: Introduction to Bayesian Analysis Procedures, for more information about convergence diagnostics and their interpretation. The effective sample sizes for each parameter are shown in Output 43.10.10. Trace, autocorrelation, and density plots for the seven model parameters are shown in Output 43.10.11 through Output 43.10.17. All indicate satisfactory convergence of the Markov chain. The prior distributions for the regression parameters are shown in Output 43.10.18. Initial values for the MCMC are shown in Output 43.10.19. The initial values of the covariates are joint estimates of their posterior modes. 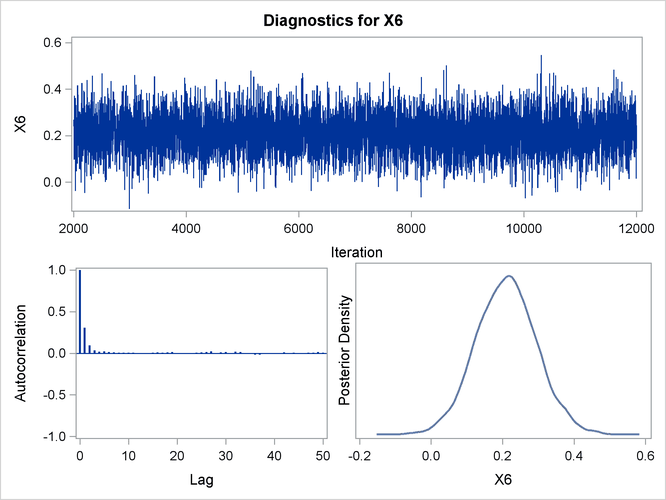 The prior distribution for X1 is informative, so the initial value of X1 is further from the MLE than the rest of the covariates. Initial values for the rest of the covariates are close to their MLEs, since noninformative prior distributions were specified for them. 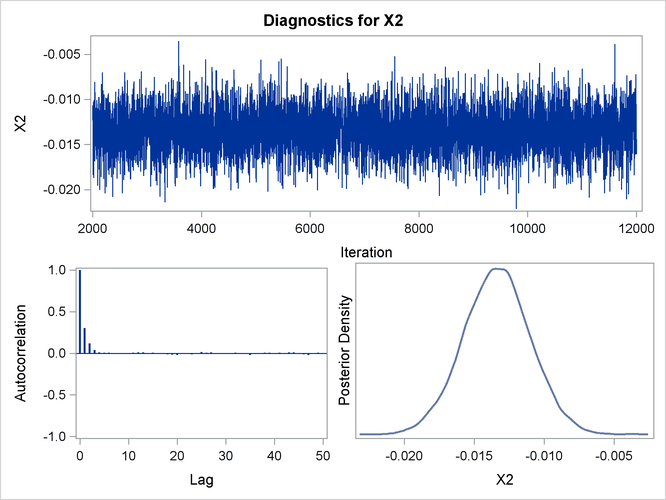 Goodness-of-fit, summary, and interval statistics are shown in Output 43.10.20. Except for X1, the statistics shown in Output 43.10.20 are very similar to the previous statistics for noninformative priors shown in Output 43.10.4 through Output 43.10.7. The point estimate for X1 is now positive. This is expected because the prior distribution on is quite informative. The distribution reflects the belief that the coefficient is positive. The distribution places the majority of its probability density on positive values. As a result, the posterior density of places more likelihood on positive values than in the noninformative case.